Two teams played out a four-day Test, but not in the way either was supposed to, as England crushed Australia in front of a jubilant crowd. A few weeks ago the stories were clear. Australia were riding high after a dominant home summer and a fifth World Cup. Their Ashes squad supposedly included four of the world’s best pacemen. They had fearsome opening slasher David Warner, two England specialists in Chris Rogers and Adam Voges, the world’s top-ranked batsman Steve Smith, and the hard-edged experience of captain Michael Clarke. Brad Haddin and Mitchell Johnson retained an England-crushing aura. Nathan Lyon and Fawad Ahmed catered for both kinds of spin. Australia breezed through two Tests in the West Indies and two first-class warm-ups in England, with good hit-outs for even the squad players. There was never any doubt that they were favourites for the Ashes. Their opponents were in the opposite position. England’s administrators had made a speciality of tripping over their own feet: their previous Ashes and World Cup campaigns were disastrous; they sacked coach Peter Moores just after hiring him a second time; high-ranking staff were booted at a motorway rate. They dragged the Kevin Pietersen issue on for months, installed the thoroughly uninspiring Andrew Strauss as director of cricket, and were promptly made to look even more foolish by his attempt to resolve it. The preceding couple of years had drained all enjoyment from playing for England. Press described the team as conservative and dispirited, captain Alastair Cook was a stodgy leader in terrible form, Stuart Broad and James Anderson had lost all threat as leaders of the attack, Moeen Ali was doubted as a tweaker, Jos Buttler and Ben Stokes were too big a gamble, and Ian Bell had long since tolled. How quickly all that changed. On the last day of Australia’s final warm-up match, Ryan Harris announced his retirement. Perhaps the finest bowler ever to so sporadically play Test cricket, a damaged bone in his leg forced his days of cameos to a close. Then to Cardiff: a blazing first innings from England, a patchy reply, and England were able to abandon caution to pile up a 412-run target. With two days left on a pitch less predictable by the hour, there was only one result. In a week, Australia have become a rabble. Their careful plans resemble a teenager’s bedroom. Mitchell Starc’s crocked ankle may nix him for Lord’s. Johnson was ineffective and took one wicket for the match. Josh Hazlewood couldn’t find his economy. Ryan Harris can’t help any of them. You’d have got long odds on Peter Siddle playing a Test this series, but he’s next in line: a reliable operator but not feared. The new squad bowler is Patrick Cummins, who hasn’t played a first-class game in two years. If you can make sense of that, you’re either an idiot or a genius. Haddin has developed a bad habit of casual one-handed catches, likely when he’s late to pick up the ball, which saw him drop eventual centurion Joe Root on nought. Haddin is also in miserable batting form, and England made a caricature of Shane Watson by delivering him two leg-before-wicket dismissals that the match situation demanded he review. Clarke barely gave Watson a bowl, costing him the chance to prove value in that department, and leaving him liable to replacement by Mitchell Marsh. It hardly seems coincidental, but with Australia’s batting so thin, a change is needed. 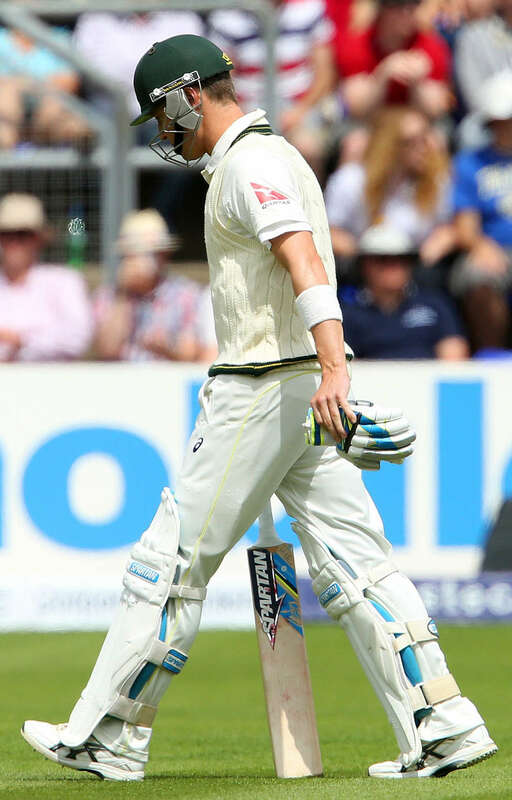 Clarke himself looked stiff and sore in the second innings after a diving slip catch might have hurt his bad back. Warner is not himself, and his returns have dipped. Voges was ordinary in his first Ashes outing. Smith was quiet. Spare batsman Shaun Marsh has a career record of one first-class game in the UK, and county experience consisting of six Twenty20 games for Glamorgan. The chances of him adapting are like the device you’d use to switch channels when he bats: remote. England’s match was the complete converse. There were runs for the under-pressure Gary Ballance in the first innings and Bell in the second. Broad and Anderson bowled excellent spells, with batsmen looking imperilled by each ball. Stokes produced muscular efforts with bat and ball. As against India, Moeen was targeted and came out on top, with five wickets for the match including Smith, Clarke and Warner. 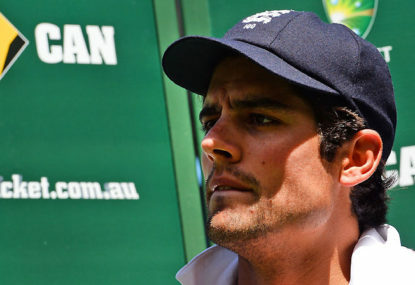 Cook’s captaincy was as newly exciting as England’s batting: attacking fields throughout, new things tried constantly. Short straight mid on, a short third slip wearing a helmet. It’s not about weirdness for its own sake, but the odd shift can keep a team interested in the field, or shake a batsman’s focus. The final day was one of those joyous ones when everything goes your way. Absurd catches stuck: Cook’s juggled leap at short midwicket to do for Haddin, the deflection from first slip to second for Starc. Root followed his 134 and his 60 with a late bowl, and while initially crashed around, replied with two late wickets. The word ‘talisman’ is overused but he’s fast becoming one: his success was everything the crowd wanted. They got rowdier, as in the space of two hours the English pundits swerved from soberly cautious to unbearably smug. When the final catch settled in Root’s hands at long on, it was almost more than the assembly could take. Within an hour, the crowd had gone, taking that satisfaction away with them. Almighty flocks of seagulls fought for leavings, cawing in echoes around Sophia Gardens and its concrete stands. The teams were already heading for London, the fans were filling the city’s bars, and the sunlit ground was left as suddenly barren as Australia’s pre-match bravado.